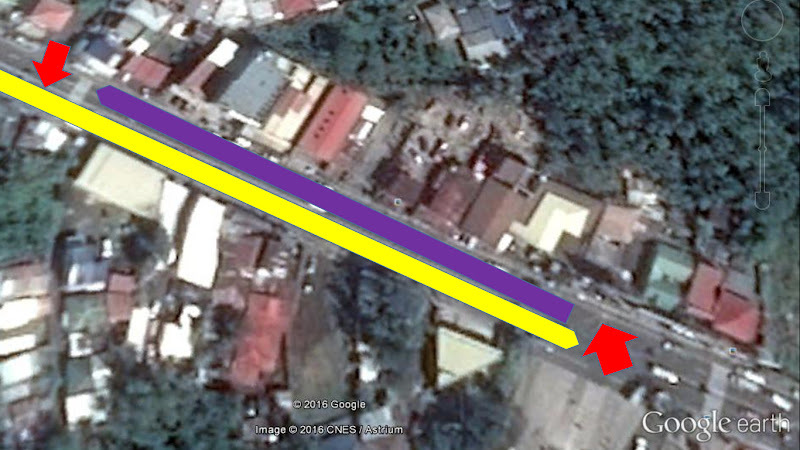 There is this tiny stretch of road along Tambo here in Lipa City, I would say 300 metres at most, that is something of a vehicle owner’s or a commuter’s booby trap. That is, you just never know when it will blow up in your face, in a manner of speaking. This stretch of road is that between the Batangas-bound gates of the STAR toll way and that itty-bitty side road beside the elementary school leading to Dizon Village. I plan my sorties uptown for groceries to avoid this trap. There is most days a window between 8:30 and 9:30 in the morning when the traffic along it is reasonable. Some days, like yesterday, the traffic just builds up and traps you like quicksand even when you do not expect it to be there. To begin with, the STAR exit is just bad engineering, period! Vehicles egressing the toll way bound for Lipa blend into traffic, as should be the case. Given the vehicle volume along Tambo most times of the day, it should not be otherwise. Although the slight delays when they do can become incremental when vehicular volume is heavy, this is not really the problem. The real problem is that not all vehicles egressing the toll way are Lipa bound. Those that are bound west need to cross the road; and herein lays the problem. 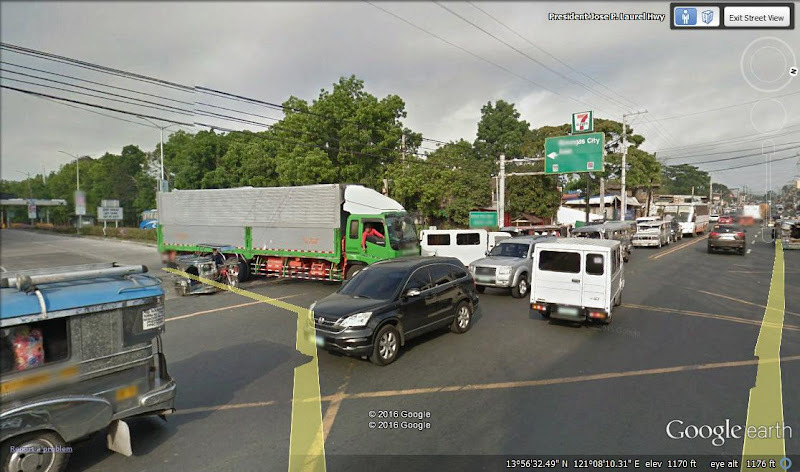 Especially on days when people have reason to go to Lipa such as on long weekends and holidays, the frequent interruption to allow egressing vehicles to cross can mean that Lipa-bound vehicles line up sometimes as far back as the Toyota facility in San Vicente. I would estimate this to be at least 2 kilometres away. Most mornings, they snake back on the average up to the front gate of the Air Base; sometimes further back to the gate of Base View Homes. Even on days when vehicular traffic is light, a flash gridlock can occur along that 300-metre stretch of road when vehicles attempt to cross from the side road beside the elementary school at the same time vehicles are being allowed to cross the road from the STAR. Traffic can quickly build up when vehicles cross indiscriminately from the side road beside the elementary school. Image credit: Google Street View. Of course, vehicles caught in between either direction are unable to move. I have lost count of the number of times this has happened in my frequent sorties uptown; and it frustrates me no end because the problem is caused by an abject lack of common sense among some motorists. What IQ does one need to see that vehicles will be unable to move if the roads are blocked in front of both exits? What IQ does one need to see that vehicles will be trapped inside? Image credit: Google Earth. Most times, there is a TMD enforcer directing traffic in front of the STAR exit. However, nobody controls the exit from the elementary school side road. When vehicles become trapped inside, in minutes the traffic can build coming from both directions. It may not be cost efficient to station an enforcer in front of this side road, but when vehicles cross indiscriminately, they can cause instant gridlock. 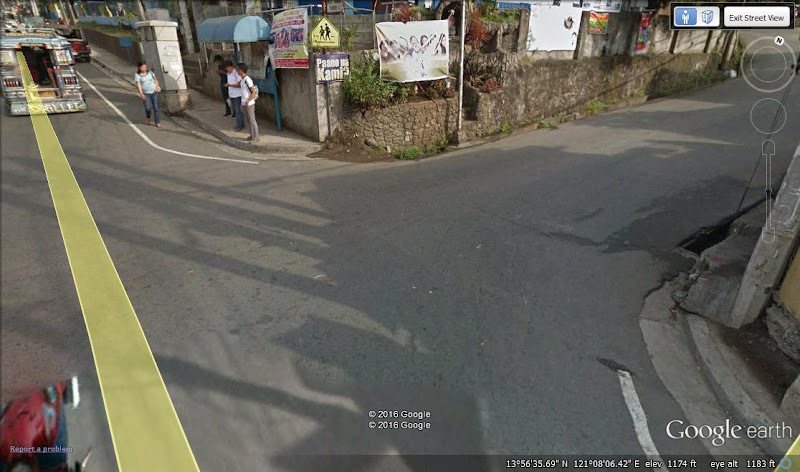 Image credit: Google Street View. I do not know what the solution is; and it may not be cost-effect to assign an enforcer at the side road because vehicles crossing from there are but intermittent. It just that when some do, they can wreak so much havoc on the traffic along the main road. What I do know is such a short stretch of road should not be allowed to impact people’s lives in such a negative way day in and day out. 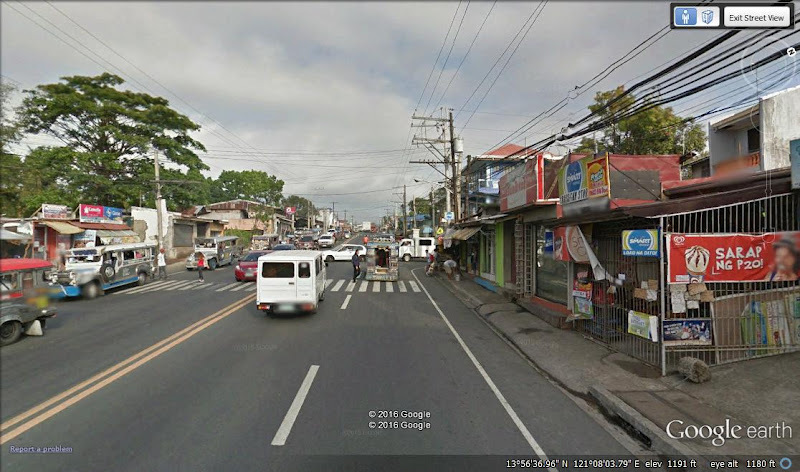 It used to be that I could expect to get to Lipa City proper from where I live in about eight minutes; and the roads were two lanes and roughly paved with asphalt. These days, the least I can expect is half an hour. That cannot be right!